BSTOCK. 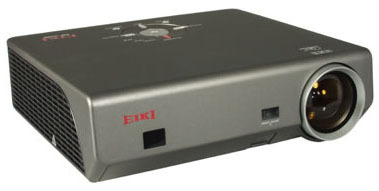 EIP-1500T. DLP® Projector 1200 ANSI Lumens Power Zoom & Focus 720p. BSTOCK: This item has been used for photographic or demonstration purposes by the manufacturer. True 720p resolution. 1080i, 1035i, 576i/p, 540p, 480i/p compatible. DVI w/HDCP, plus Component, S-Video and Composite Video. Powered Optical Iris system adjusts contrast and brightness. Up to 2500:1 Contrast Ratio. Up to 1200 ANSI Lumens Brightness. 5X Speed, 6 Segment Color Wheel for minimum color artifacts. Air Bearing Color Wheel for quiet operation: only 32 dBA in Eco mode. Installation flexibility: Wide Range (1.5X) Power Zoom and Focus Lens. Preset image offset. Vertical and Horizontal keystone correction. Compact, low profile shape. Sealed optics: no air filter to maintain. Compatible with computer resolutions from XGA to VGA, and MAC. Power Management function shuts down the projector. Color Temperature adjustment. Gamma adjustment.